Achieving the rank of Eagle Scout is an honor that is increasingly rare in the Boy Scout community. Only 4 percent of Scouts actually go on to complete the long list of requirements necessary for the rank. 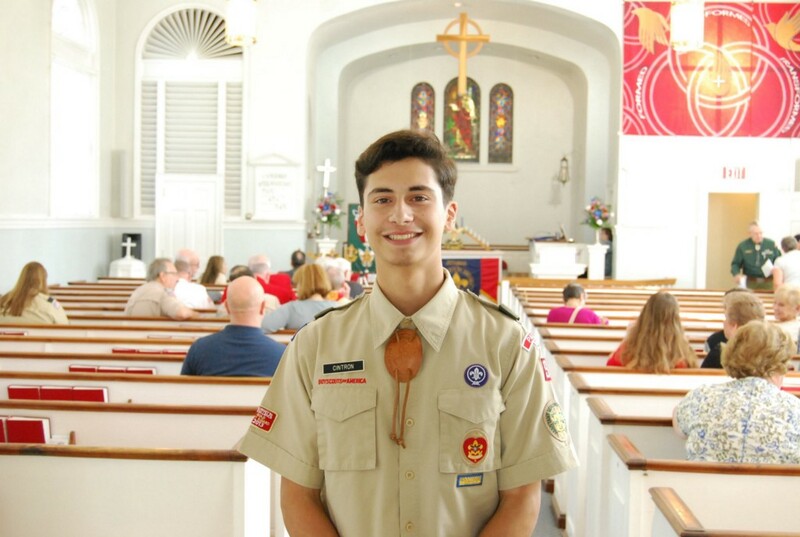 Recent Palmyra High School graduate Roberto Cintron joined this small percentage when he was awarded the rank at a ceremony on Sunday, Sept. 30, at Bethany Lutheran Church. The aim of his Eagle Scout project was to assist war veterans who were never recognized for their service to America. Despite a somewhat diminished role in our world today, Cintron believes the Scouts are as relevant as ever. His mother Sandra introduced him to Scouting at a young age. When he was in first grade, she signed him up for Cub Scouts. “What attracted us to Scouting was the fact that we liked the adventures, outdoor skills and a positive place for Scouts to have fun while learning,” she said. Cintron was an incoming senior when he set himself to starting his project in the summer of 2017. “I always knew I wanted to do something for veterans even before I started planning,” said Cintron. Sandra remembers a Cub Scout trip to Arlington National Cemetery early in Cintron’s career that left a lasting impression on him. “He was truly inspired by what he had seen. He was deeply moved as to how many were buried there, all that for us to be free,” she said. Cintron teamed up with his Scout Leader and mentor Bill Isard and the two formed a team that met monthly to work on the project. Isard has been with the Scouts for almost 50 years and he trusted Cintron was up to the challenge. “He’s a very strong young man, when he starts something he sees it through,” said Isard. He connected Cintron to the Burlington County Marine Corps League. Under Cintron’s leadership, the group set to work seeking military veterans in Burlington County who were eligible for a Purple Heart, a military decoration awarded to those wounded or killed while serving. It was slow going at first. They posted fliers reaching out to veterans, but many soldiers, especially those who had served during the Vietnam War, weren’t eager to revisit their experience. The application process for a Purple Heart is also complicated and presents another roadblock for veterans who may be eligible. It requires two eyewitness statements, a situation and casualty report, medical documentation showing combat injury, deployment orders and a personal narrative. “It was a lot of research and sitting in front of a screen, requesting records and digging. It’s a long process,” said Cintron. A big part of his project was developing a PowerPoint geared toward making the process less complicated. The PowerPoint describes each step of the process in detail and provides links that can point veterans in the right direction when it comes to obtaining the records needed to meet each requirement. Don Mathews is one veteran Cintron was able to help with his project. They made progress Mathews would otherwise have been unable to make gathering everything he needed to apply for a Purple Heart. Through the process, they also discovered he was eligible for both a Silver and Bronze Star. Sandra couldn’t be more proud of her son and what he accomplished. She and Cintron’s father were there cheering him on during his Eagle Scout ceremony.